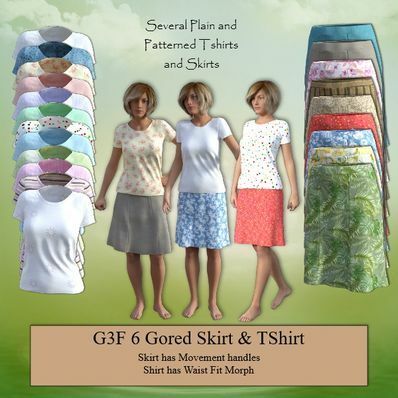 6 Gored Skirt & TShirt for Genesis 3 Female for use in Daz Studio 4.8. Movement Handles included. I have also included a small waist fit on TShirt. Wow, nice job I just found yor web, thanks!! Very nice work! Love it! Thank you so much! Perfect fit, nice textures - thank you very much! This is fantastic, so many choices and colors. An every day outfit is so perfect for everything!! You are amazing! Very comfortable looking outfit. Thank you!